This rendering shows the proposed Gold Line station at 3M. One of the big benefits of the Gold Line BRT project is that it provides convenient, all-day access to jobs. Source: Gateway Corridor. 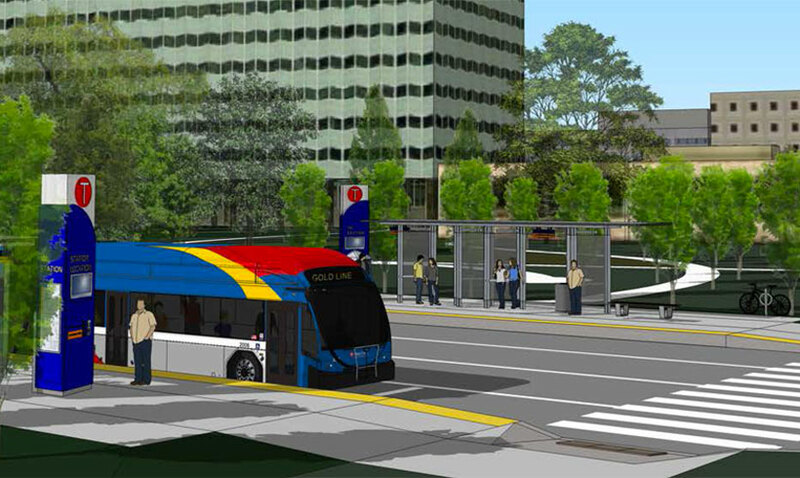 Officials are expected to select a new route for the Gold Line bus rapid transit (BRT) project before 2016 is over. Early this month, dozens of community members attended an open house to learn more and weigh in. Also known as the Gateway Corridor, the proposed Gold Line would operate between the Union Depot in downtown Saint Paul and Landfall, Maplewood, Oakdale, and Woodbury in Washington County. Buses would run next to Interstate 94 in an exclusive lane. Like Goldilocks’s porridge, the Gold Line and other BRT projects are designed to be “just right.” They provide fast, reliable transit service with some of the benefits of light rail—including level boarding, enhanced stations where riders can pay in advance and wait comfortably, and a dedicated corridor for avoiding traffic jams—but at a lower cost. This combination helps improve service in areas without the high level of ridership needed to make rail the best option. One key feature of the Gold Line is that it will run earlier in the mornings, all day, and later at night than existing, heavily used commuter express buses. That’s very important for second and third shift workers—or even people working 9-5 who find themselves needing to stay late or head home early for unexpected reasons such as a sick child or a huge workload. 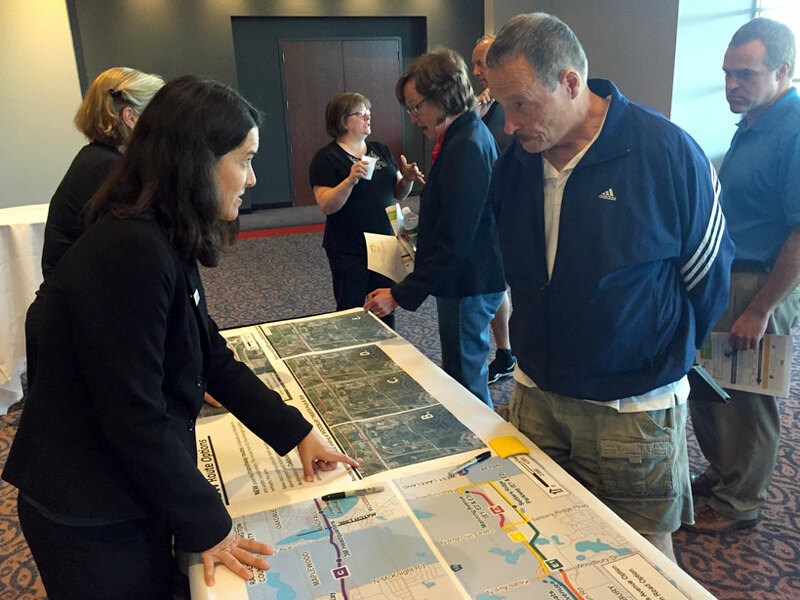 At the recent Gold Line open house, I overhead a lot of positive, constructive comments about the project. For example, Gene was one of the local residents who showed up to learn more about the proposal and provide helpful feedback for the planners. As someone who lives near proposed stations, he had on-the-ground insight into where people are already walking and biking. He and a number of other residents highlighted that taking the opportunity for Gold Line construction to improve pedestrian crossings at key intersections is important to them. Another attendee said that though she liked BRT, she would have preferred light rail. 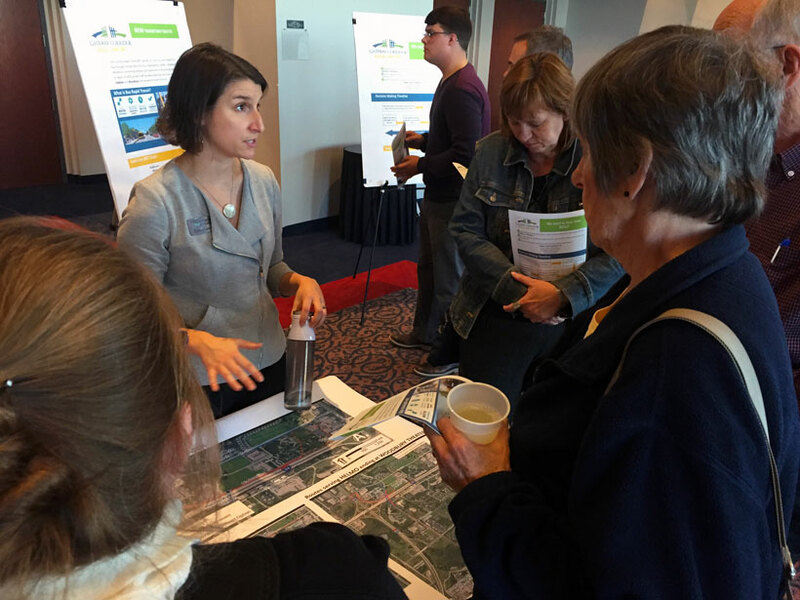 Community members engaged at the recent Gold Line open house in Oakdale. Still, a small but vocal group of local opposition has emerged and pushed against state funding and against local municipal approval of the project. Earlier this year, the Lake Elmo City Council rejected their section of the route, forcing planners to adjust that segment of the line. TLC supports expansion of transit in the east metro and better connections between Saint Paul and the eastern suburbs. Despite the spurts of anti-transit activities, the truth is that they are in a clear minority. In fact, a 2016 Washington County poll of residents identified lack of transit options as their top concern. That’s higher than taxes, higher than crime, higher than traffic congestion. Advancing transit improvements better reflects the will of the east metro than the concerns of these opponents. Learn more about the project and speak up for transit improvements in the east metro at the Gold Line public hearing in Woodbury on November 10. Can’t make it? Share your feedback online.